Not all recipes made with only natural ingredients are guilt-free... but these TOTALLY are! Here are some fun recipes for good eats without anything artificial. This soup is hearty, vegetarian-friendly, and DELICIOUS! Bring a large pot to medium heat on the stove. Add oil and onion and stir to coat. Stirring occasionally, cook until softened, 6 - 8 minutes. Reduce heat to medium low and continue to cook and stir until browned and caramelized, 15 - 20 minutes. Add carrot, turnip, cauliflower, and garlic to the pot. Stir well. 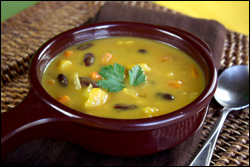 Raise heat to medium and, stirring occasionally, continue to cook until vegetables are slightly soft, about 5 minutes. Add soup, beans, salt, cayenne pepper, and 1 cup water to the pot. Stir well. Raise heat to medium high, cover, and bring to a boil. Reduce heat to low, and allow to simmer (covered) until veggies have completely softened, 25 - 30 minutes. Serve it up and, if you like, season to taste with extra cayenne pepper. Yum time! Quinoa. That's right, we're going there. Don't fear these quirky grains -- they're tasty, good for you, and easier to cook than you might think! Spray 2 large baking sheets with nonstick spray. Place zucchini, onion, and eggplant on sheets in a single layer. Set aside. In a small bowl, combine vinegar, oil, salt, and black pepper. Mix well. Using your fingers or a brush, evenly spread half of the mixture on top of the veggies on the sheets. Flip veggies, and spread with the remaining mixture. Bake in the oven until veggies are tender, 20 - 25 minutes. Set aside to cool, but leave oven on. Transfer quinoa to a large bowl. Once baked veggies are cool enough to handle, roughly chop and add to the large bowl. Add basil, garlic, and feta cheese, and stir thoroughly. Set aside. Carefully slice off the top (stem side) of each bell pepper, about a half-inch slice from each. Remove and discard seeds. Place peppers cut-side up in a deep 9" X 13" baking pan. If peppers do not sit flat, gently lean them against the pan sides for support. 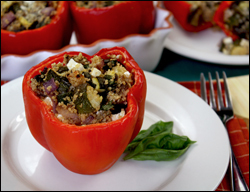 Evenly distribute the quinoa-veggie mixture among the bell peppers, about 1 cup each. Bake until peppers are soft and filling is hot, 20 - 25 minutes. Just stick with the info provided in today's HG FYI, and you can be eating these guilt-free, naturally delicious foods in no time! Fun-in-the-Sunrise Piña Colada Oatmeal - This tropical b-fast bowl will start the morning off right! Chick-a-licious Fruity Green Salad - This salad is loaded with good-for-you items and deliciousness. For an all-natural dressing, check out the low-fat varieties in the Newman's Own line. Sesame Salmon & Snap Peas en Foil - An easy and natural weeknight dinner -- LOVE this recipe! Simply Sweet Meatballs - Three ingredients. Pineapple, tomatoes, and ground turkey. THAT'S ALL. Food RULES, and so do your buddies. Click "Send to a Friend" to pass these recipes around! It's National Noodle Day, October 6th. Noodles ROCK, but some are too starchy. That's why we LOVE House Foods Tofu Shirataki noodles -- try 'em in some Vampire-Proof Chicken 'n Veggie Pasta!